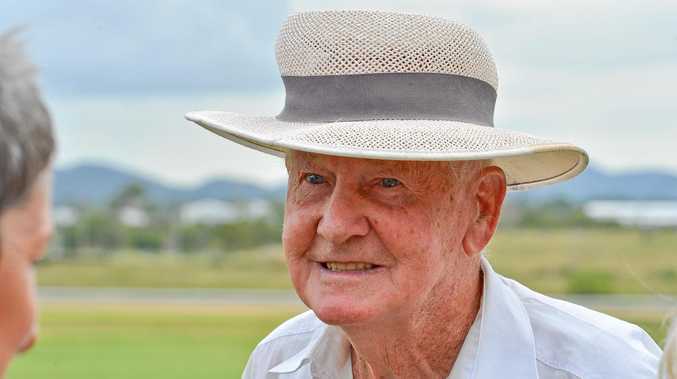 KNOWN only as 'the waving man' to many Boyne Island residents, Jim Cole passed away on Saturday June 23, aged 89. His daughter Janet Rigney said when Jim moved to Boyne Island about six years ago he started waving to everyone as they drove past and saying hello to everyone he met on the streets. "He wasn't really well-known in the community otherwise," she said. Jim was born in Tottenham, London in 1929, during the depression. He was one of eight children, and like many others at the time his family was dirt poor. "Dad was a barrow boy, he'd go with his grandparents door to door in the wealthier areas and ask them for old clothes," Janet said. Jim grew up in the lead-up to World War II, and was about ten when Britain declared war on Germany. His son Paul recounted one of the few stories Jim shared with his family from that time. 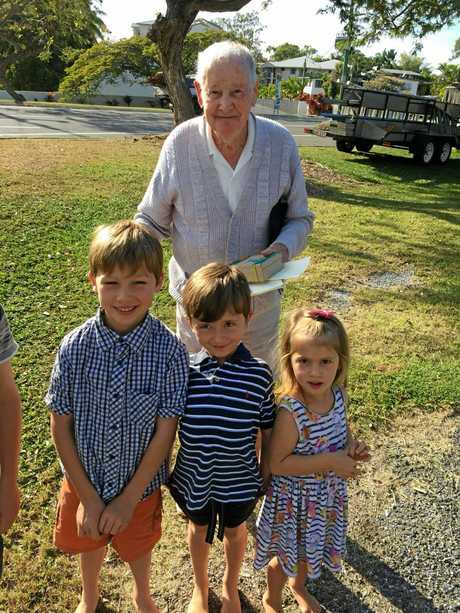 MEETING THE LOCALS: Jim Cole at Boyne Island with Will, 6, Alex, 5 and Zoe Richardson, 3. "(Germany) used to launch motorised (un-manned) bombs,from France, they'd be flying along then they'd cut out and just glide," Paul said. "They'd go anywhere, (once they cut out) wherever the wind took them and then they'd blow up the whole block. They were called doodlebugs. "Dad was sitting on the front steps of his house one day and he could hear a doodlebug coming, then it cut out and it was heading straight for him. "You couldn't run anywhere, you didn't know where it was going to go, you just had to sit there and hope for the best. At the last minute a little gust of wind came and the bomb blew up the next block over, otherwise Dad might never have made it to Australia. During the war, the London neighbourhood where Jim lived was a tight-knit community. People would trade eggs for tomatoes or corn and everyone would rush to help put out fires when a block was bombed. Paul thinks it was Jim's experiences with the war and the depression that contributed to his generosity. 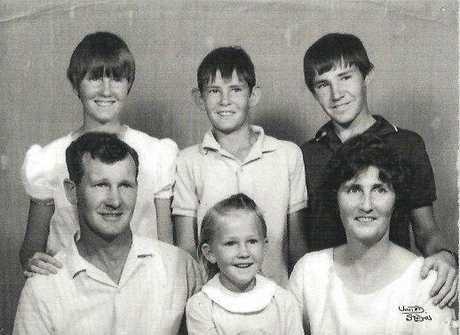 In 1958 Jim sailed to Australia as a "Ten Pound Pom" with his wife Iris and three children - Cameron, Ruth and Paul. Janet was not yet born. FAMILY: Jim Cole with his wife Iris and their four children Ruth, Paul, Cameron (back row) and Janet (front row). The young family settled near Biloela, where Jim worked at the Callide open-cut coal mine. Jim would work in mining until he retired. Paul said Jim's life centred around his family, he had a happy personality, and was never one to criticise others. He was interested in people, and would engage anyone he met in conversation. 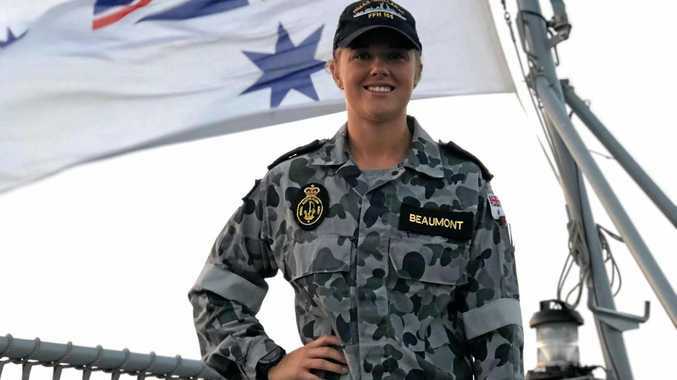 "He used to be a worry, when we were kids, we'd go somewhere and there'd be this group of motorcyclists, he'd go over and start chatting to them," he said. "Mum and us have gone 'You've got to be kidding, why are you walking among those bikies?' but they just accepted him." Janet said her favourite memory of her dad was the love he showed for his wife Iris. He looked after her when she became ill, and she passed away about ten years ago. He also loved dancing and music and would often bring out a harmonica, though he never had lessons. Paul said the Boyne Island street where Jim spent his last independent days had a great sense of community. Jim was looked out for by others, and he looked out for other people too, doing their shopping or taking them to the post office to pay their bills. "He'd go to McDonald's and get a coffee and an apple pie and take it round to someone's place on a Sunday morning," Janet said. Jim spent his final year in Bindaree Lodge, an aged care facility, and his children said he got on well with the staff who took 'amazing' care of him. He passed away peacefully and is survived by his two younger children, 10 grandchildren and 10 great grandchildren. "He had a good life," Paul said. 'Beautiful soul': Residents speak out about "Mr Happy"
Boyne Tannum residents share stories of happy "waving man"